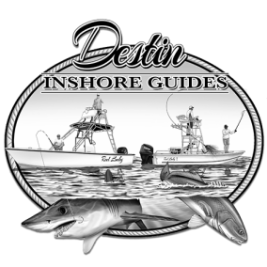 On inshore gulf guided fishing trips we venture into the Gulf of Mexico fishing near shore, generally within sight of land. These trips consist of two types of fishing, trolling and bottom fishing. While trolling, either lures or live baits will be used with the targeted species being King Mackerel, Spanish Mackerel, Amberjack, and Bonita. With those being the most common species of fish caught trolling in Destin we also catch other species while trolling that we call "bonus fish" because you just never know what you will catch. 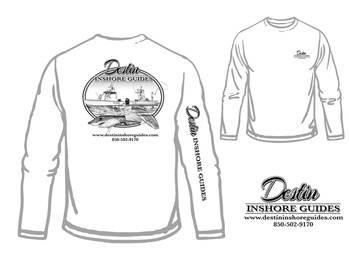 These "bonus fish" include Mahi Mahi, Cobias, Black Fin Tunas, and the occasional inshore trophy catch the "Sailfish". When bottom fishing we fish a mixture of natural bottom reefs and man-made structures known as wrecks. We will be targeting a wide variety of fish including Red Snappers, Black Snappers, Vermillion Snappers "Mingo Snappers", Amberjack, Trigger Fish, and Groupers. Sight fishing along the beautiful beach is also available during certain times of the year. Cobias migrate our beaches in the spring, Tarpon roam the beaches during the summer months, and during the fall and winter months Red Fish cruise the beaches in huge schools making them the perfect sight fishing target.